The “official” birthday of the beer can is January 24, 1935—the day cans of Krueger’s Finest Beer and Krueger’s Cream Ale first went on sale in Richmond, VA. According to Brewery Collectibles Club of America, “the beer can really made its debut some 14 months earlier—just before the repeal of Prohibition” when the American Can company engineered a workable beer can. Some 85 years prior to the introduction of the beer can in America, Bernhard Stroh emigrated from Kirn, German to establish a brewery in Detroit in 1850 called Lion’s Head Brewery, according to the company’s website. After his passing in 1882, his sons Julius and Bernhard Jr. expanded the company, first calling it the B. Stroh Brewing Company and later the Stroh Brewery Company. During Prohibition, they operated under the name The Stroh Products Company (producing near beer with its alcohol extracted, birch beer, malt products, soft drinks and ice cream). After the Repeal of Prohibition in 1933, beer was once again the focus…and within a short period of time, canned beer was introduced. In 1964, Stroh’s began its expansion with a buyout of the Goebel Brewing Company and in the years that followed, they acquired the rights to several other brands including Schaefer, Schlitz, Old Milwaukee and G. Heileman Brewing Company’s “Old Style”—a canned beer that was made in nearby Frankenmuth. By the early 1980s, the Detroit-based Stroh’s was the third largest brewing enterprise in America but that title was short lived. In the mid-1980s, production ceased and the brand products were sold to Pabst Brewing Company. Frankenmuth has been home to many breweries over its history, since being settled in 1845. In addition to G. Heileman, there was Cass River Brewery (which became Geyer Bros. Brewing Company), Carling Brewing Company, Carling-National, Frankenmuth Brewing Company and Frankenmuth Brewery—many of which produced beer in cans. The first beverage cans were flat topped cans made of tin, opened with a church key that left triangular punctures in the lid through which the beer was poured. Next, low profile or j-spout cone top cans with crimped caps (similar to the caps used on bottled beer today) were introduced. By the early 1940s, cans still represented only 10 percent of the beer market share—despite the fact that they were easily discarded, there was no deposit as there was with bottles, they were lighter to transport and easier to stack and store. That percentage decreased significantly at the onset of World War II as tin was needed for more important purposes. It wasn’t until 1958 when Coors Brewing Co. of Golden, Colorado unveiled its recyclable aluminum cans, changing the entire beverage industry. It was about this time that the way cans were opened also changed. By the early 1960s, the “pull tab” method became the most common way to open a can, followed by the “push tab” used primarily by Coors in the mid-1970s. Today’s “stay tab” was actually developed in the 1970s, although many consider it a more modern contribution to the craft beverage industry. A “wide mouth” version was introduced in the 1990s. In the most recent wave of craft brewing in Michigan, early adopters of the can were Rochester Mills Beer Company (est. 1998) and Keweenaw Brewing (est. 2004). It was 10 years into its operation before RMBC began canning, offering 12-ounce cans at its Rochester Mills pub in 2008 before expanding to 16-ounce pint size cans at its Production Brewery in 2012. Keweenaw Brewing was the first Michigan microbrewery to produce its beer exclusively in cans (since the very beginning), starting with Pick Axe Blonde. Today, they have five styles in the market year-round, with two seasonals that were introduced in 2015. 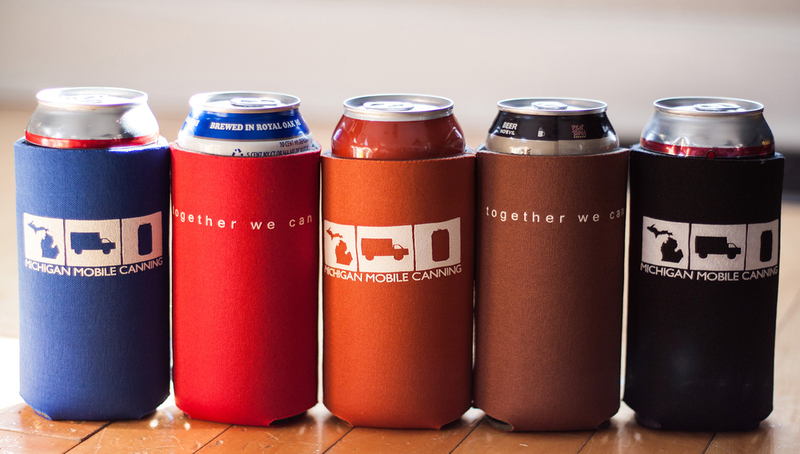 Over the past few years, a growing number of Michigan breweries have begun to distribute their products in cans instead of or in addition to bottles. Nearly 30 different Michigan breweries now offer canned beer, with more than 150 different products in the marketplace (see lists below). And while many have invested in their own in-house canning lines, many are enlisting the help of local entrepreneurs interested in seeing the industry not only succeed but continue to grow and expand their brands. *If we have inadvertently missed a Michigan craft brewery in can distribution, please email details to media@michiganbrewersguild.org.